If you're scouting for a casual yet stylish getup, wear a The Row turtle neck jumper with a black leather maxi skirt. Both garments are totally comfy and will look fabulous together. Throw in a pair of black leather heeled sandals to kick things up to the next level. 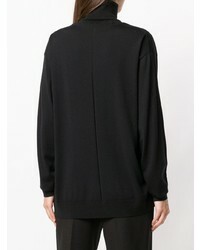 If you're searching for a casual yet stylish getup, try pairing a The Row turtle neck jumper from farfetch.com with black ripped skinny jeans. Both items are totally comfy and will look fabulous together. For a smart casual outfit, wear a The Row turtle neck jumper from farfetch.com with light blue tapered pants — these two pieces fit really well together. White leather pumps are a nice choice to complete the look. If you're hunting for a casual yet totally stylish look, try teaming a The Row turtle neck jumper from farfetch.com with grey wool shorts. Both items are totally comfy and will look fabulous paired together. This outfit is complemented perfectly with burgundy suede pumps. 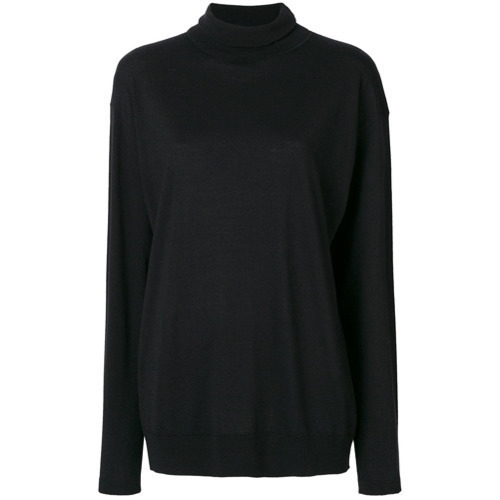 If you're on the hunt for a casual yet absolutely chic ensemble, try teaming a The Row turtle neck jumper from farfetch.com with a black wool skater skirt. Both items are totally comfy and will look fabulous paired together. When it comes to shoes, this getup is complemented wonderfully with black suede knee high boots. For an on-trend getup without the need to sacrifice on practicality, we love this combination of a The Row turtle neck jumper and a tan cable sweater. You could perhaps get a little creative in the shoe department and elevate your getup with black suede over the knee boots. 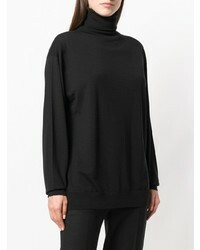 For a casually elegant getup, choose a The Row turtle neck jumper from farfetch.com and black leather skinny pants — these two pieces fit really well together. When it comes to shoes, this look is round off nicely with black leather pumps. If you're looking for a casual yet totally chic outfit, go for a The Row turtle neck jumper and blue skinny jeans. Both pieces are totally comfy and will look fabulous together. When it comes to shoes, this getup is round off really well with black suede over the knee boots. For a casual stylish ensemble, reach for a The Row turtle neck jumper and olive skinny pants — these items go pretty good together. For the maximum chicness grab a pair of beige leather pumps.